This is not a complicated dish and whenever I make beef ularthiyathu, or Beef Pepper roast, I take a handful of meat and cook with salt alone to make this thoran. Cabbage Irachi thoran is yet another delicious combination thoran, like beans carrot thoran, Vazhakoombu cherupayar thoran, Padavalanga carrot thoran, Unakkachemmeen Manga thoran, Cheera Parippu Thoran etc. and a tasty side dish for rice. You may also like my other delicious thoran recipes like Peechinga Thoran, Vanpayar thoran, Mushroom thoran, Beans thoran, Meen mutta thoran, Unakkachemmeen Manga thoran etc. Cabbage can be paired with Fish, mutton and chicken also. You can try many variations with cabbage and like my cabbage cherupayar thoran, Fish in Cabbage curry etc. all the cabbage combinations are really delicious. Also, Cabbage is an excellent source of Vitamin K, Vitamin C, minerals and rich in Antioxidants and Flavonoids. Paired with proteins, this thoran is a healthy choice for kids. 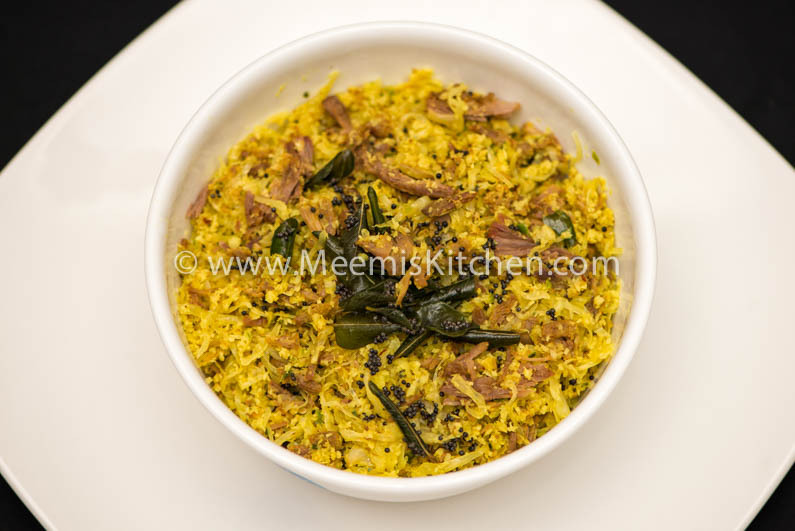 Try this Kerala style Cabbage Irachi Thoran and let me know if you like it. Green chilly : 2 – 3 nos. Clean and cook the beef with salt. 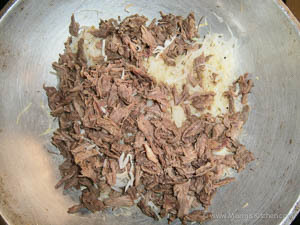 Pound the beef (chathakkuka) and shred them into small pieces. Keep aside. Soak the cabbage in salt water for some time and chop finely. 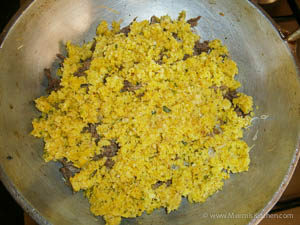 Grind the coconut coarsely with onion, green chili, curry leaves and turmeric. Heat coconut oil in a pan, pop mustards and curry leaves and keep aside. Add the cabbage into the pan, mix salt and cover and cook for 2 – 3 minutes on low flame. 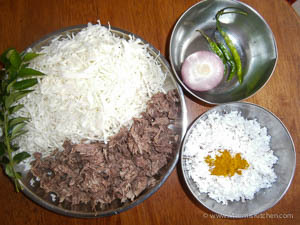 Now, add the shredded beef and top it with ground coconut mix. Cover and cook again for few minutes. Combine well and adjust salt. Sprinkle the mustard and curry leaves. Transfer to a serving plate and enjoy with hot rice.